In “Why America Fights,” Susan A. Brewer, a professor of history at the University of Wisconsin at Stevens Point, says wartime presidents chant political propaganda instinctively, as if leveling with the citizenry would rally dissent and gum the chances for conquest. In understated prose and meticulous detail — 595 end notes in six chapters — Brewer ably argues that the strategies of presidential persuasion for starting or remaining in wars are little more than watery stews of lies, bluffs and exaggerations or the perfuming of facts to scent the air with what Donald Rumsfeld called “perception management.” Brewer examines the narratives of six military efforts: the Philippine War, World War I, World War II, the Korean War, the Vietnam War and the Iraq war. Under a succession of presidents — McKinley, Wilson, Roosevelt, Truman, Kennedy, Johnson, Nixon and Bush — American involvement was enshrined as humanitarian and the enemy demonized as barbaric. Whether the United States went to the Philippines to aid what William McKinley called our “little brown brothers,” or to Iraq for what Bush called “a divine mission,” or to extend Madeleine Albright’s credo that America is “the indispensable nation. We stand tall. We see further into the future than other countries,” Americans suffered few civilian casualties and saw other lands ravaged, not their own. With presidents trying to persuade — not educate — the public, Brewer writes, a “propaganda campaign seeks to disguise a paradoxical message: war is not a time for citizens to have an informed debate and make up their own minds even as they fight in the name of freedom to do just that.” Brewer’s scholarship on the manipulation of public opinion places her in the company of Noam Chomsky, James Loewen, Michael True, Howard Zinn and other historians or social analysts of skeptical bent. Like them, she scours the record to counter the historical amnesia of the public. She documents how presidents at war portrayed themselves as travelers on the high road to peace and justice, not the low road to battle and dystopia: “Throughout the twentieth century, American leaders presented war aims dedicated to the spread of democracy and freedom rather than the expansion of U.S. power.” Although, Brewer writes, “the United States repeatedly denied that it sought more territory, it steadily acquired naval and military bases. 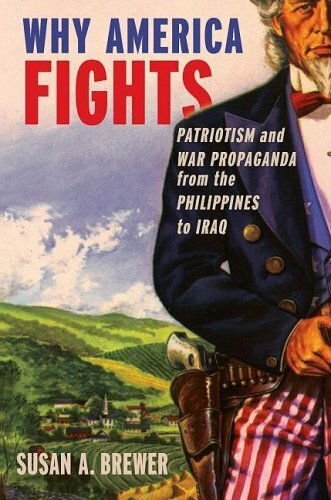 As of 2008, the United States had more than seven hundred bases in 132 countries. . . . Its priority was the maintenance of governments, whether democratic or not, that allowed the Americans economic and strategic access to their countries.” “Why America Fights” would be stronger had a chapter been devoted to the mainstream media, which so often act as dummies dandled on the knees of presidential ventriloquists mouthing propaganda. While Brewer touches on the collective complicity in spots — the Pentagon’s Office of Media Outreach and its “Operation Truth” campaign to bring pliant talk show hosts to Iraq, the Committee on Public Information that sold reporters on Woodrow Wilson’s “war to end war” policies — her analysis lacks the depth found in Norman Solomon’s 2005 book, “War Made Easy: How Presidents and Pundits Keep Spinning Us to Death” or William Blum’s 2003 “Killing Hope: U.S. Military and CIA Interventions Since World War II.” Brewer’s interpretation of presidential propaganda is likely to be dismissed by keepers of the temple’s secrets as a baleful outburst by a lefty professor hawking her ideological assumptions. That might be plausible, except that “Why America Fights” soars well above the usual marks of bias: carelessness, rants or conclusions not connected to facts. Brewer’s work is one with George Orwell’s line in “Homage to Catalonia”: “One of the most horrible features of war is that the war-propaganda, all the screaming and lies and hatred, comes invariably from people who are not fighting.” It also gives credibility to Martin Luther King Jr.’s April 4, 1967, comment: “The greatest purveyor of violence in the world today [is] my own government.” The accuracy of that judgment, heightened, not lessened, by the passing of time, might be better relished if more historians were as questioning as Susan Brewer. Text: Brewer Susan A.. pp. 352; hardcover. Publisher: Oxford University Press, Oxford, 2009.